Click the OPEN FILE button to open a browse window that defaults to the D:/ drive on your computer. If there is no D:/ drive, it will open the C:/ drive. It will always ‘remember’ the last location you browsed to when selecting a file to open. When you’ve completed the segmenting of a file, click EMBED SEG DATA to add the segment information as METADATA to the end of the file. This information is part of the file, so it ‘travels’ wherever the file goes, and with any copies made. 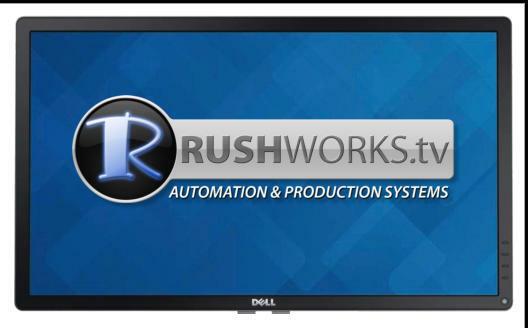 This is often called “non-destructive” editing because it leaves the original file intact, just adding segment data for use with RUSHWORKS A-LIST Automation Systems. If you want to create individual files based on the segments you’ve identified, click CREATE FILES. You’ll confirm that you want to create NEW, SEPARATE FILES for each of the segments. Click OK and you’ll see a browser window open to where the original file is located. You can Save the individual files to the same folder, or create a New folder into which you can save the individual files. In either case the new files will have the same name as the original file, but with a segment number at the end and before the extension, e.g. “Sports Sunday-01.mpg, Sports Sunday -02.mpg”, etc. Click CREATE SEG LIST to generate a text file that contains the names and time codes of all the individual segments defined in the metadata embedded in the file. The program has UNDO and REDO functions for every change made while the current file is loaded. When you single-click on any of these segments in the list, they highlight, and that segment becomes selected on the timeline. The [ADD] button name also changes to [UPDATE]. You can then play that segment, edit the In/Out points, or even delete it by clicking the [DELETE] button at the bottom of the segment window. The TOTAL SEGMENT DURATION is always displayed in yellow at the bottom, and updated as you ADD, UPDATE or DELETE segments. With SEGMENTR PRO you get a powerful and versatile video file segmenting utility … AND the added bonus of built-in LKFS audio normalizing or True Peak limiting, which is now federally mandated for compliance by broadcasters. 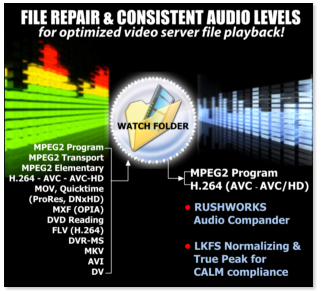 The CALM Act (Commercial Advertising Loudness Mitigation Act) follows the SMPTE Recommended Practice: Techniques for Establishing and Maintaining Audio Loudness for Digital Television (A/85). SEGMENTR PRO is a helpful utility for creating “virtual segments” as metadata that are stored within a file. You can also save marked segments as multiple, individual files. It is bundled with FileRx, which is used for repairing and transcoding many file formats into MPEG-2 or H.264, and normalizing audio levels. Just drop any of the file formats listed into the WATCH FOLDER for immediate processing. 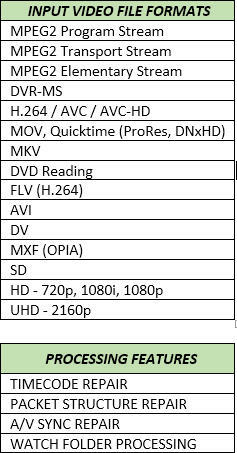 Choose either MPEG2 or H.264 for the new files, which are placed in the OUTPUT folder for scheduling and/or segmenting. 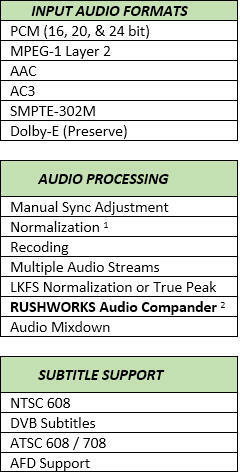 FileRx includes RUSHWORKS’ exclusive Audio Compander (compressor/expander), a proprietary two-pass algorithm that averages all audio information and processes the output level to the specified level (e.g. -12dBFS) for consistent file playback level.